Take control of your MIDI Keyboard! VelPro is a velocity fixer for your USB MIDI keyboard controllers. It runs on Windows® and OSX®. 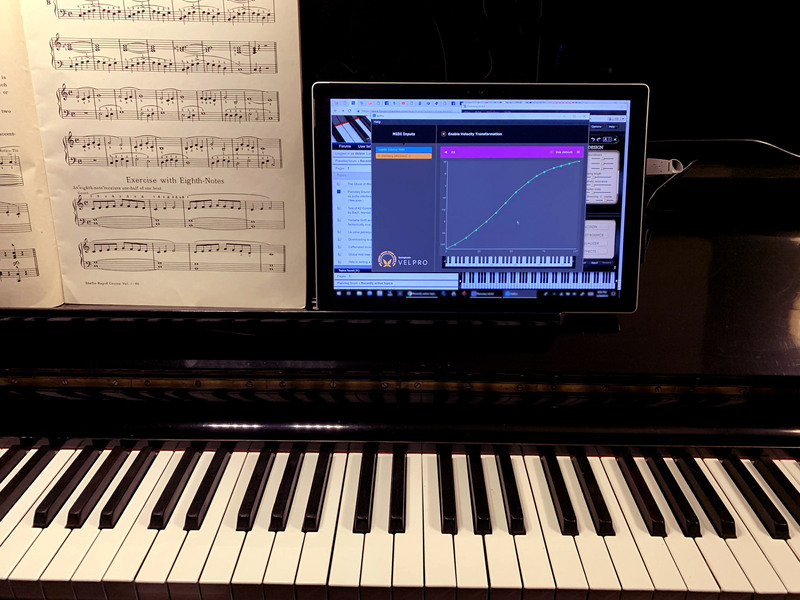 VelPro lets you create a custom response curve for each note of your keyboard. Are not satisfied with how your keyboard responds out of the box => correct its behaviour using our application. Tend to hit the keys too soft or too hard (if you're used to a real piano for instance) => make your controller adapt to your touch. David uses a QRS PNOscan II MIDI strip sensor hidden into his upright Steinway Model F from 1885. The sensor sends MIDI data to a Surface tablet running Pianoteq from Modartt to synthesize realistic piano sounds. VelPro processes this MIDI data before it hits the synthesizer. This way, David can have the exact musical response expected from a real piano. Step 3 : Play on your keyboard as usual! Play like you usually do. Your controller input automatically goes through VelPro before your music application. Bonus: Explore finer settings and set a different curve for individual keys by unchecking their "use default" box. PC with Windows® 8 up to Windows® 10 - 64bit. Mac with OSX 10.8 or more recent. Click Checkout and validate your cart. Once you're done, you will receive an email containing all the instructions for activation. Your Springbeats account lets you manage your subscriptions and download your license again in case you lose it. Your license can be activated on 3 different machines. For more information about our data retaining policy, please read our legal notice. Need help? Don't hesitate, contact us at sales@springbeats.com. Demo version does not save your presets! Please consider purchasing a full license if you like the product and would like to unlock its full potential!